In light of the virtually unlimited opportunities that cloud technology has to offer, FAR EASTONE has officially initiated its "Cloud Mobile Office" today (November 11) and announced a joint-venture with ASUS and its subsidiary ASUS Cloud to engage in full-fledged collaboration on cloud services. Through the realization of the cloud concept, users may enjoy the convenience and efficiency of cloud technologies at any time without having to pay staggering fees for the purchase and installation of relevant equipment and facilities. "ASUS WebStorage" is the cloud storage service jointly provided by FAR EASTONE and ASUS, and it is the best instance of cloud concept adoption by enterprises. In addition to a variety of useful functions such as backup, sharing, synchronization, ASUS WebStorage also serves as a comprehensive project operation assistive tool to help businesses embrace cloud services with greater ease. Daniel Chang, Executive Vice-President of FAR EASTONE Telecommunications’ Enterprise & Carrier Business Unit, stated, "FAR EASTONE’s Cloud Mobile Office comes with incredibly rich contents that covers a Cloud Conference Room, Cloud Storage Service, Cloud CRM, Cloud EIP and so forth. Cloud mobile applications are the most important services FAR EASTONE offers and ensure continual improvement of corporate value after the rapid cultivation of corporate client market through the company’s campaign of ‘Five Major Corporate Strengths – One Number, Cross-Strait, Logistic Connection, Cloud Technology and Information Security’. Today, FAR EASTONE is working with ASUS WebStorage, which has already secured a vast subscriber base of over 3 million users around the world. Through information and telecommunication integration and implementation of hardware + software bundling, our corporate clients will be up-to-date with the latest trends in cloud applications". Chang also noted that, "According to our forecasts, by 2013, the percentage of Smartphone adoption will reach 25% (i.e. 1 out of every 4 mobile phones in the market will be a Smartphone) and the anticipation of such growth is the greatest incentive for corporations to adopt service mobilization. As such, due to its close connection to Smartphone, cloud applications will become the largest blue ocean market for corporate clients, given its vast business opportunities and potentials. Wu Han-Chang, President of ASUS Cloud Corporation, was also present at the event today. He commented, "Innovative development of hardware and cloud service integrated application has already ascended to become of pivotal importance in ASUS’ global strategic development. ASUS WebStorage has once again demonstrated the unlimited possibilities of cloud application and ASUS’ capacity for innovation no matter how you perceive it, be it the development of a business solution, the launch of a cloud printing application or the debut of a Cloud Mobile Office solution. The partnership between ASUS and FAR EASTONE shall deliver added value and improved cloud experience to consumers, thanks to the powerful features of handheld devices." The development of corporate operation systems has progressed from the PC in the early years to the Inter-web of the last decade, and has eventually arrived at the stage of mobile application of today. The trend of tomorrow shall be the integration of all three components, akin to the geometric development from point – line – plane. With ASUS WebStorage cloud solution, we fulfill the vision of ideal data access for both enterprises and individual users: regardless of where you might be, you may access data from multiple PCs with your handheld device. As for the future, FAR EASTONE shall continue to think from the perspective of subscribers and their needs, to turn ideas into reality, regardless of platforms (be it the IaaS model, PaaS platform deployment or SaaS application). FAR EASTONE shall also be guided by innovative concepts and incorporate other mobile services such as mobile signature, LBS and so forth so that every subscriber would become well informed mobile service users to operate at peak efficiency. 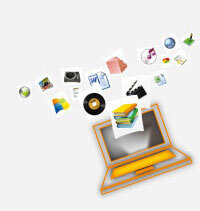 Cloud Mobile Office is a comprehensive solution for different needs. In the future, FAR EASTONE shall continue to work with ASUS and other key partners to develop different corporate application solutions, while aggressively seeking developers for Cloud CRM and Cloud Task Assignment applications to create more possibilities for Cloud Mobile Office. Meanwhile, FAR EASTONE has not forgotten the calls from small and medium enterprises for special telecommunication rates as shown in the surveys and will soon be launching the "FAR EASTONE MVPN Voice Teleconferencing Service" (a solid solution at an affordable price), which will allow users from over 100 different geographical locations to take part in a real-time teleconference using their mobile phones. The solution will not only help enterprises cut down costs on telecommunication but also enhance their mobile capacity, communication and time-effectiveness.